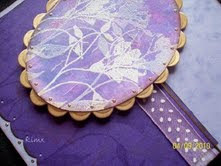 Cut out part of the pattern from the floral printed paper sheet and glue this to the base card leaving a quarter of an inch of white card showing. Mix the mica powders with water and paint the orchids. 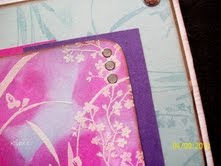 Stamp the lady onto a piece of white card and paint her also with the mica powders. Colour an oblong piece of white card with the mica powders, then stamp the 'Happy Anniversary' stamp in black Stazon ink. Fix a piece of ribbon across the bottom right hand corner and fix the lady to the bottom right of card using sticky foam pads. Add the greeting and fix it as though she was sitting upon it. Paint around all 4 edges of the base card with mica powders. That's it folks, finished Hope you like it. Today we are showcasing another creation by Kim, for this card she has used our Fressia stamp which you can purchase at Imagination Crafts Website. The central panel on this one has been stamped and embossed using Versamark and white embossing powder and then sponged with Silkies. 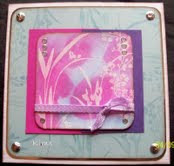 Kim then blended and stamped several times to give multiple resist effect. The embossing acts as a resist but don't forget to wipe over the image with a piece of paper towel when you have finished spongingjust to remove any excess inks. 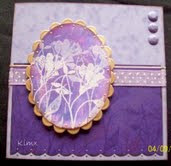 The punched purple panel along the bottom has been stamped with Versamarka and then brushed with Mica Powders. The embossing acts as a resist but don't forget to wipe over the image with a piece of paper towel when you have finished sponging just to remove any excess inks.